Pivotal to the rewilding concept is the extinction dynamics of top-down regulation by large carnivores, known as the “three C’s: Cores, Corridors, and Carnivores.” Fraser takes these concepts into the very real world of threatened species and the humans who are at work to save and restore space and species— grassroots activists like the parataxonomists in Costa Rica and the Australian Gondwana Link project, which is reinvigorating native plants. Fraser is on time to report on rewilding, an idea globally embraced by conservationists with a plethora of positive action, advanced by Patagonia, with their Freedom to Roam 2007-08 campaign and informed by Dave Foreman’s, 2004 book Rewilding North America, A Vision for Conservation in the 21st Century. If ever there was a conservation idea ready to take hold and change awareness, it’s rewilding in 2010. If ever there was a conservation idea ready to take hold and change awareness, it’s rewilding in 2010. 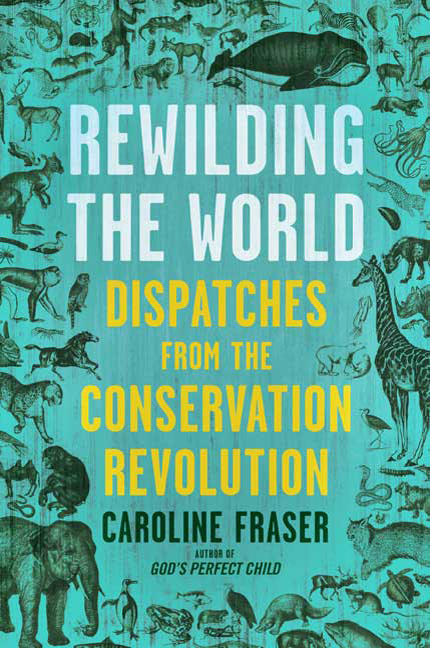 Bringing disparate work together to paint a vital picture of engaged conservation, Fraser gives the reader a rare glimpse at the broader pattern in a fabric often seen only as a few threads. Part travel narrative, part on-the-ground reporting, and part analysis, Fraser leaves the reader informed and hopeful—an unusual combination in today’s ecological state of affairs. Caroline Fraser’s first book, God’s Perfect Child: Living and Dying in the Christian Science Church, was selected as a New York Times Book Review Notable Book and a Los Angeles Times Book Review Best Book. Her work has appeared in The New Yorker, The New York Review of Books, and Outside magazine, among others. She lives in Santa Fe, New Mexico. Pamela Biery is a freelance writer and PR professional living in the Bay Area.